THE PRETENDERS: THE PRETENDERS: 1980: 5 STARS OUT OF 5 STARS: A great debut album and it ranks high on most lists of greatest 80’s albums. 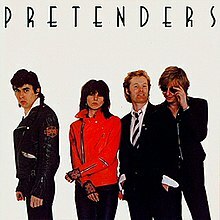 Easily the best Pretenders album. Brass In Pocket, Kid, Precious, Mystery Achievement, Tattooed Love Boys and the cover of The Kinks Stop Your Sobbing my favorites. This album debuted at #1 on the album charts in the UK- peaked at #9 in the US. JOHN STEWART: CALIFORNIA BLOODLINES: 1969: 5 STARS OUT OF 5 STARS: One of those great albums you never hear much about. Stewart recorded the album in the same studio that Bob Dylan recorded Nashville Skyline in and used some of the same musicians. A folk rock album. Nick Venet who signed The Beach Boys and produced their early work produces this. No hit singles on this- Stewart today is mostly remembered for the hit Gold- in 1979. Favorites- California Bloodlines, She Believes In Me, Never Goin’ Back, Omaha Rainbow. THE DRIFTERS: THE DRIFTERS GOLDEN HITS: 1968: 5 STARS OUT OF 5 STARS: A great introduction to The Drifters- has most of their biggest hits-12 songs here in all- I ended up buying their box set decades later when it came out. Save The Last Dance For Me, On Broadway, Under The Boardwalk, Up On The Roof, There Goes My Baby- etc. They used songs from great songwriters- Doc Pomus, Goffin-King- Mann and Weil, Leiber and Stoller. O’JAYS: BACK STABBERS: 1972: 4 1/2 STARS OUT OF 5 STARS: It wasn’t until their 7th album that the O’Jays became a big chart success-going to the Philadelphia International label and Gamble and Huff a very wise move. Two hit singles Back Stabbers #3 and Love Train #1. The album made the top 10. One of the great early 70’s soul albums and the Philadelphia sound was never better. 10000 MANIACS: N MY TRIBE: 1987: 3 1/2 STARS: Their 3rd album- and break through album. There were no big hits on it- a couple singles got airplay-Like The Weather and What’s The Matter Here- on mainstream rock stations. Their cover of Cat Stevens “Peace Train” got attention. Many of the songs on the album were about social issues. 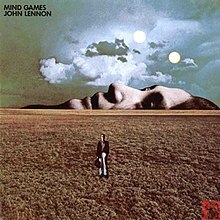 JOHN LENNON: MIND GAMES: 1973: 4 STARS OUT OF 5: Coming after the album with Yoko- Some Time In New York City which was a fiasco- this sounded like a pretty good album- and it is just that pretty good not great.. I think the critic Stephen Thomas Erlewine sums it up pretty well when he writes-“confusion … lies at the heart of the album. Lennon doesn’t know which way to go, so he tries everything.” Erlewine adds: “While the best numbers are among Lennon’s finest, there’s only a handful of them, and the remainder of the record is simply pleasant. Lennon would make one more album of original material before taking a 5 year break -which at the time was taken by everyone as his retirement. Mind Games was the only single off the album #18 in the US. EDDY GRANT: KILLER ON THE RAMPAGE: 1982: 4 STARS OUT OF 5 STARS: Electric Avenue was one of my favorite singles of 1982. The only knowledge I had about Grant before that- was he was the writer of Police On My Back- which was covered by The Clash on Sandinista. This was his 7th solo album and his commercial breakthough- going to #10 on the album chart- Electric Avenue #2. I Don’t Wanna Dance went to #1 in the UK- but only #53 in the US. Electric Avenue by the way is in the south London district of Brixton. Favorite cuts- Electric Avenue, I Don’t Wanna Dance, It’s All In You, War Party and Killer On The Rampage. WILLIE NELSON: PHASES AND STAGES: 1974: 5 STARS OUT OF 5 STARS: A concept album about a divorce- side one tells the woman’s story, side two the man’s side of the story. Produced by Jerry Wexler. This was the album before his big commercial breakthough with Red Headed Stranger. Considered to be one of Willie’s best albums by many. Enjoy In My Tribe. I wore my CD out in the late80s thru the mid90s, and just recently got it out again. It’s a rare one, that I can listen to from start to finish without skipping any tracks. I did have my fave tracks though–Painted Desert, Don’t Talk, Peace Train and Verdi Cries. They had a good stretch there- liked the next album too. John Lennon – I liked more than one but I Know (I Know) may be my favorite. Wonderful block of music. I’m a big fan of all of these albums except for the Dan Fogelburg. I like the Fogelburg, Tim Weisman album Twin Sons of Different Mothers. The Pretenders is one of my all time favorite albums. Huge fan. Their followup was disappointing. Backstabbers is an awesome album. I’ve had the privilege of seeing them live. Spectacular. I agree outside of a couple songs- The Pretenders follow up was kind of a disappointment.